First Line: "Mum!" I exclaimed. "Thank God you've called. I've been so worried." As the face of popular television series Fakes & Treasures, Kat Stanford has decided that she's had her fill of intrusions into her privacy. What she wants now is a quiet life, a small antiques shop with living quarters above it for her mother, and for the man she loves to finalize his divorce so they can begin sharing their lives together. However, as Robbie Burns once said, "The best laid schemes o' mice and men Gang aft agley." Now that her father is dead, Kat's mother goes incommunicado, and Kat finally finds her in a rundown carriage house on the Honeychurch Hall estate in Devon. Iris has bought what Kat considers to be a death trap, and that's not the only surprise she has in store for her daughter. Come to think of it, everyone on the estate seems to have some sort of secret, but it's not until the body of the housekeeper is found in the grotto and Iris is one of the suspects that Kat understands she's going to have to sort through all those secrets to find a motive for murder. I loved this book! I was in the mood for funny, zany, quirky, eccentric, slightly over-the-top skullduggery (can you tell by the plethora of adjectives? ), and author Hannah Dennison has delivered the goods with style and flair. The setting is a peach: a remote estate in Devon badly in need of restoration and simply stuffed to the rafters with priceless antiques. Honeychurch Hall is one of those country houses that was added to by each generation over the centuries, so secret tunnels and the like should come as no surprise. The setting adds a Gothic touch to the book that I really enjoyed. The cast is the biggest assortment of eccentrics that you'll meet for a long time. Kat herself is the sanest of the lot-- regardless of her celebrity status-- and she helps readers stay tethered to the ground. We need the tether because the rest of the cast is bonkers. The matriarch of Honeychurch Hall rides sidesaddle, insists that her snuff box collection is disappearing, and is often seen with her 7-year-old grandson who identifies with Biggles. Almost every single estate worker comes from a long line of Honeychurch Hall servants, and they all have their (nearly) incomprehensible relationships and secrets. However, Kat's mother Iris is probably the one character who has the most astounding secrets. Kat is definitely going to have her hands full as this series progresses. 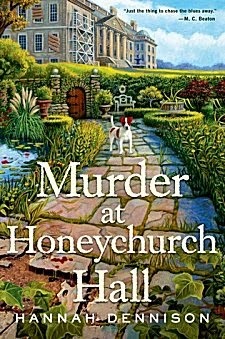 The first half of Murder at Honeychurch Hall is fast-paced, almost frantic, and I can see it leaving some readers dizzy with the introduction of several characters, the setting, the British slang, and the like. But Dennison is in her element. She has a purpose, and she is definitely having fun. The second half of the book settles down to allow readers to catch their breath, and we begin to see individual characters and their motivations in a much clearer light. It's these motivations that add a depth to the story that some may find surprising and I found to be delightful. As much as I liked Dennison's characters, setting, and story, it is her sense of fun that captured me. Sometimes as I read a book, the way the various elements come together tell me how much the author was enjoying herself as she wrote. If Dennison had half as much fun as I think she did, I can't wait for the next book in this new series. Cathy - I'll confess I just skimmed your review, as I have this one on my TBR. So glad you liked it as much as you did, and I'm looking forward to reading it. I hope you enjoy it as much as I did, Margot!